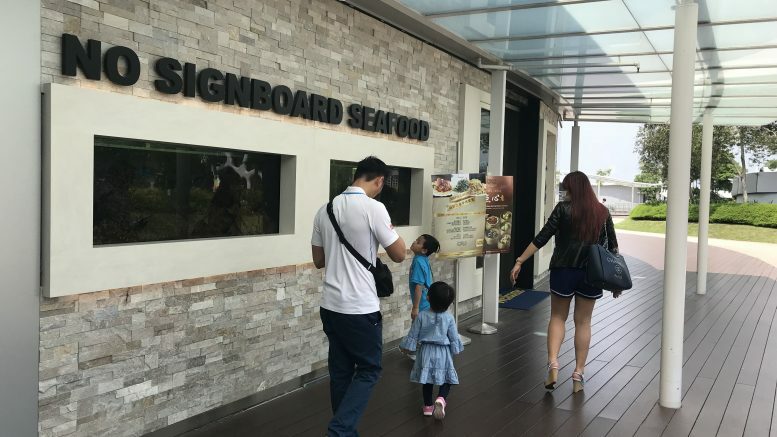 The No Signboard Seafood outlet at VivoCity mall in Singapore; taken in 2018. The 0.23 percent stake in the company, or 1.07 million shares, had initially been purchased on No Signboard’s behalf by UOB Kay Hian on 31 January, but the transaction didn’t have the board’s approval, it said in a filing to SGX late on Friday. However, No Signboard said that even with the ownership of the shares transferred to UOBKH, there were still two breaches of trading rules in the transaction. On 31 January, the company’s shares jumped 23.97 percent to the day’s high of S$0.15 in a surge of volume, before No Signboard requested a trading halt during the mid-day break. In response to the SGX query, No Signboard said that shareholders had approved a share buyback mandate at its annual general meeting on the morning of 31 January. After the approval, Executive Chairman and CEO Lim Yong Sim had instructed the company’s brokerage, UOB Kay Hian, to queue to buy shares at a price of up to S$0.14, with a total of 1.07 million shares purchased as of 12:12 P.M. SGT on Thursday, 31 January, the filing said. No Signboard had called it an “honest mistake” by Lim as he hadn’t realized the purchase price exceeded the allowable price cap under the share buyback mandate; in addition, the buyback also breached “black-out period” rules as its earnings results hadn’t yet been reported, the company had told SGX. Correction: This article has been updated to reflect that the shares were bought back on 31 January.